I'm looking for a new Yaris to replace my current 1999 model. 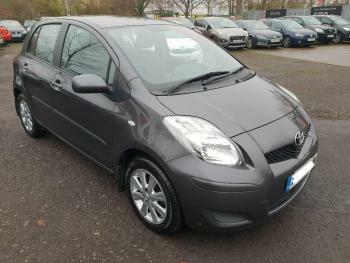 I've found a 2009 one with a 1.33 litre engine and start/stop etc. It also has a full service history, drives nicely, engine runs quietly, bodywork and interior in good condition. However, it has 94,000 miles which I know for it's age is average, but do you think it will last me for the next 5 or 6 years with regular servicing etc.? I average about 8,000 miles per year. If it's been cared for then it will last and last, regular servicing is key to long life especially if quality parts are used. As you say the mileage is average for the age of the car. Before purchasing any used vehicle I would check out its history as much as I could such as its MOT history (this should show you if it has failed over the years its reasons and any advisories given) Just enter the reg number on the GOV.com web site. https://www.gov.uk/check-mot-history If it has a full dealer history then checks can be made to see what work has been carried out especially when out of warranty.Other checks such as hpi are advisable. I've seen plenty of well looked after cars but there are a few out there which have not. I also use the 'vehicle smart' app on my phone. AS above...if it's been cared for and has had what it's needed in service terms, then I wouldn't worry at all...they are good little motors and will go on and on if looked after....check it's MOT history and make sure the price reflects the mileage. Thank you for the replies. Out of interest, what would you expect to pay for a car of this description? Dealer or private? If private then approx £2k to £4k but then I haven't seen the car! Just an update to say i've bought the car I mentioned for £2500. It's in very nice condition, I hope it will be as reliable as my old Yaris. Thanks for posting! Looks tidy and if the missing wiper arm nut cover on the passenger side annoys you then a new replacement can be had from Toyota for approx. £6. Thanks! Just bought one on Toyota's eBay shop. Looks in very good nick. I had a MK1 for 2 years then moved on to my cousin for another 2 years and no problems whatsoever. A few of my relatives had the MK2 just like yours and they have been great servants. I would think your one will last another 10 years+.